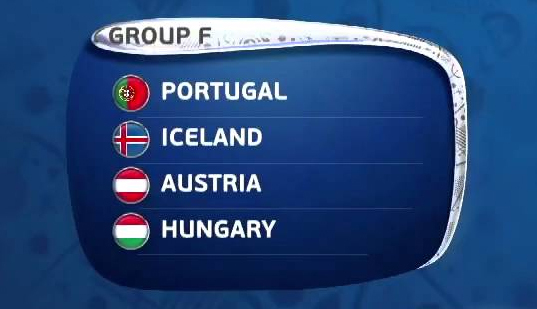 The last group of this stage of the competition, Group F features Cristiano Ronaldo and his Portugal side, former UEFA Euro co-hosts Austria, Hungary who will make their first appearance in the tournament since 1972 and surprising debutants Iceland. Will the simulator produce a few surprises in this group? Austria qualified to this summer's tournament without a loss, winning nine of their ten matches and drawing once, coming atop their group which included Russia and Sweden. Needless to say, they were pretty heavy favorites coming into their match with Hungary who had to go through a play-off against Norway to secure their spot at the 2016 Euros. And it all started as expected with Austria having the better of the scoring chances, taking the lead in the 27th minute with a goal from Bayern Munich's 23 year old David Alaba. The 1-0 scoreline held at the half, but the Austrians came out even stronger in the second, with Stoke City's Marko Arnautović and Basel's Marc Janko scoring in the 52nd and 67th respectively. But just as the match seemed to be wrapped-up in Austria's favor Hungary's Ádám Szalai pulled one back just a minute after Austria's 3rd goal. Five minutes later Hungary was on the scoresheet once more when Tamás Priskin put one in the back of the net, providing hope for an unlikely Hungarian comeback. A minute later it was Priskin once again, meeting a cross into the box with his head to level the score, to the shock of the spectators. Portugal got off to a great start in the tournament against debutants Iceland. After a flurry of chances early in the match, a Cristiano Ronaldo shot from outside the box was deflected by defender Ragnar Sigurðsson into his own net to give Portugal an early lead in the 15th minute. Ten minutes later it was Ronaldo again, this time his powerful shot went straight in. Iceland would get one back before the half when Nantes striker Kolbeinn Sigþórsson pounced on a ball inside the Portuguese box and scored from close-range. But an Icelandic comeback would not come true on this day as Portugal secured the 3 points with a third goal from Éder in the 88th minute. After picking up an unlikely draw in huge comeback fashion in their first match, Hungary would have to settle for yet another 1 point final; Iceland's first point in a Euro tournament. Both goals came within the first 20 minutes of the match with the Hungarians taking a 1-0 lead in just the 5th minute when Tamás Priskin scored his third of the tournament, while Iceland's Kolbeinn Sigþórsson hit his second of the summer in the 19th. While both played a pretty open style of football in their first match, the meeting between Portugal and Austria was anything but, as the two defended well to a scoreless draw. Portugal were in a great spot to secure the top of Group F, but for a second match in a row were unable to get on the scoresheet, with Hungary's stubborn defence working tirelessly the entire match, which in fact was dominated by the Portuguese. Austria were able to clinch the first place in Group F on the last day of play as Portugal were unable to secure the full 3 points against Hungary. This means the Austrians will play Belgium in the next round, while Portugal will be matched against the runner-ups of Group B, England. Hungary meanwhile does make the cut of a best 3rd place team spot in the next round and will face Group C winners Germany.